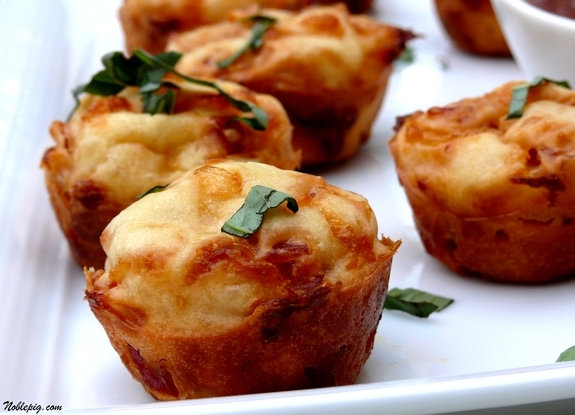 Your family will go crazy for these Pepperoni Pizza Puffs. They are the perfect after-school and play date snack. However, adults tend to gobble them up as well. See this recipe MADE ON VIDEO HERE. If I ask my kids what they want for dinner, there’s a ninety percent chance they will say pizza. They love it, as most kids do. I guess I have an affection for it too, but we don’t indulge too often. If I had to choose a favorite pizza, it would be the Hawaiian, but no one else in my household appreciates its flavors like I do, too bad for them. So when my kids came home from school and I had this afternoon snack waiting for them, they were pretty excited to be having pizza at 3 PM. Okay, so was I, can you blame me? These are the simplest, yummiest little bites. It’s like pizza but inside out. Pepperoni and cheese on the inside, wrapped in crust and then dipped in sauce, what could be better? You can easily use store bought pizza sauce or you can make my recipe for the ULTIMATE PIZZA SAUCE, it’s the best. If you have a mini muffin pan you are good to go. If you don’t have one, hurry and pick one up, you don’t want to miss out on these. Microwave the pizza sauce until warmed through, then stir in 1 Tablespoon basil. Sprinkle the puffs with the remaining 1 Tablespoon basil. Serve the puffs with the pizza sauce for dipping. 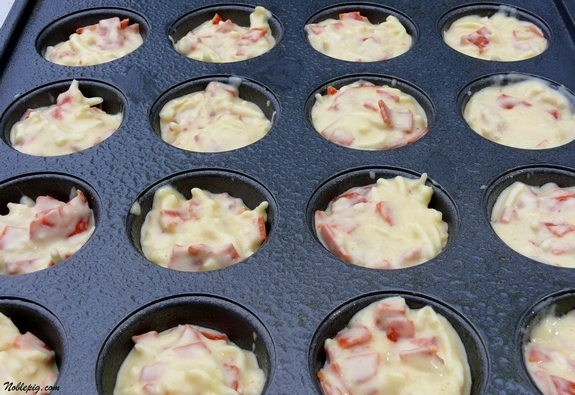 Preheat oven to 375 degrees F. Grease a 24-cup mini muffin pan. In a large bowl, whisk together the flour and baking powder; whisk in the milk and egg. Stir in the mozzarella and pepperoni; let stand for 10 minutes. Outstanding idea and they look delicious. I’m sure they are something this 63 year old kid would enjoy for an after school snack. I love Hawaiian pizza too! These little bites would be great for a party…I’m definitely saving this one! Wonderful! I am always looking for ways to use up the 5 minutes pizza dough that is always in my fridge! Quick and easy! very nice! Great idea for party appetizers! These are definitely going on the Sunday Dinner rotation at our home! Oh these are adorable…I am going to make them for a party! Crab cakes and pizza bites I thonk I am in heaven on the Noble Pig. I’m with you on the Pineapple and Canadian Bacon pizza. 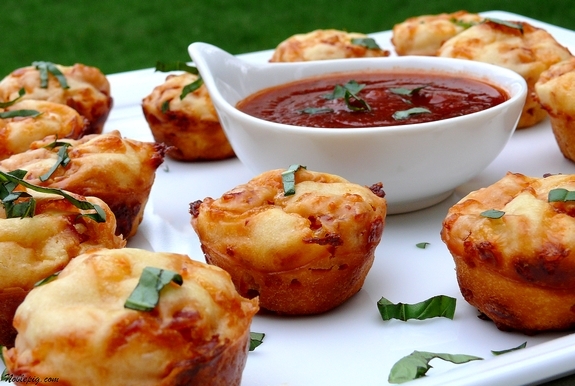 These pizza puffs are such a great idea. These look fabulous and will definitely make an appearance at my home this weekend. Question: Can they be made in a standard muffin tin? I do not have much use for a mini muffin tin, so I don’t really want to go get one just for this recipe. Those look scrumptious! Can’t wait to try them. Thank you for posting. Fun idea for a perfect Spring party. Damn it Cathy these look so good they make me angry. I’m actually scared to make them because I know that from then on that’s all my husband will want for dinner! 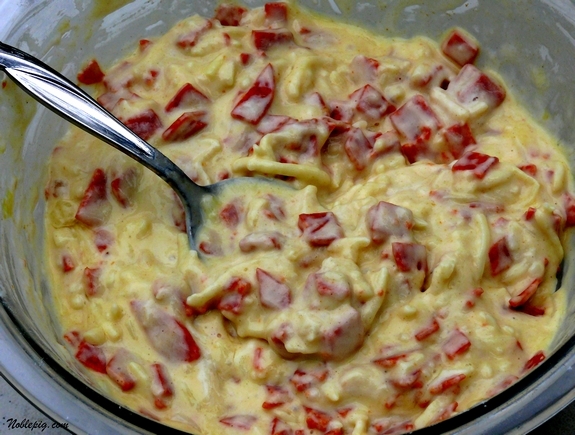 MMM these are going to do the trick on our usual “munchie” Friday menu – course with the addition of red pepper flakes. Ha. Those look wonderful. I’m going to try these this weekend. Those will be a hit at my house!! All right, that’s just awesome. I also love Hawaiian pizza and so does my girlfriend, so we would totally do them up like that. Good times. Hawaiian pizza is the only kind my hubby will eat, and I can already see that these, made with ham and pineapple, will be a huge hit around here. Cheese alone for Gaby and me! I just made these for my kids and they went crazy for them!! All are gone. These look great for a party! I’m already thinking of various fillings to make a few kinds at once. these would make an awesome midnight snack, straight from the fridge. i really like this idea, cathy–thanks! What a great recipe!! No need to make a true pizza dough either. I’m currently wishing my daughter was old enough to eat real food so that I had an excuse to make these and eat them all myself. Your recipes are awesome by the way. These would be so perfect as an appetizer at a party–I can’t wait to make them! And I love new uses for my mini-muffin tin! these are so incredibly cute! who said anything about kids–my husband would eat pizza every day of the week! I am thinking a glass of Syrah with this pizza!!!!! You are inspired. I just made these for an afternoon snack for hubby and me and they are GONE. These are pure evil! They’re scrumptious and so quick to make it’s ridiculous. YUM! My husband loves pizza and I am always looking for new ways to make it at home. I have the pan and I am making them soon. Congratulations by the way on the license! Just took them out of the oven…OMG!!! Sorry, We have to disagree. Followed recipe as written and these turned out very spongy and egg tasting. bought the special pan and everything. I was looking forward to experimenting with different ingredients but unfortunately will not be making these again. My baby loves peperoni rolls…..I can’t wait to make this for her. She will love them. Thanks for the new take!! Hmmmm, that’s too bad and very odd that with just one egg they would be “egg” tasting. It’s possible the sponginess you spoke of came from over-mixing of the flour? I have made these several times with perfect results so I think something was up. I’ve had lots of people make these as well and they have all turned out nicely. Possibly a mis-measuring of ingredients? I wouldn’t give up just yet. I don’t see why not, of course you will have to watch them as the cooking time might change. I am making these!! My kids will love them, too. Thanks. You can keep your Hawaiian pizza – I’ll take pepperoni any day over that! These look amazing! Thanks for sharing, and I hope you have a wonderful Easter! Oh wow, these would be a big his with my daughter. What a delicious recipe! These would definitely be a hit with the teenage boys sleeping on our floor downstairs this morning. I think they’ve wiped out the supply of frozen pizzas. These look fresh and wonderful! You’re killin’ me with these! OMG! If I made these for an after-school treat for my son, he’d be lucky if there were any left by the time he got home. They sound delicious! He usually gets frozen pizza rolls so maybe I’ll surprise him one day with these! Thanks for sharing the recipe. I’m bookmarking now! It’s funny for the first few years of my life I didn’t like pizza. However, after the switch in my brain turned on and I realized what I was missing, I can tell you that I would have been SO HAPPY to have had something like this waiting for me after school. Funny, I just made these today for lunch for my kids. I made them regular muffin size and they were gone within minutes. Definitely a favorite. They are easy and delicious. I think I will play around with the different cheeses and “toppings.” I also used skim milk instead of whole to lower the calories a bit. yum! We made three batches tonight! OMG! so easy! I want to love them so much! I want to just take them out of the oven! they look DELICIOUS! I am going to try these. These look to be a great finger food for parties! Easy, fast, cheap and very good. Will make these again. I will note, you must grease pan well, I used a release spray and had some removal issues. Not the recipes fault, purely operator error. Thank you. Made 2 batches for a party tomorrow night. They turned out great and were so easy! Next time I make them (and I will make them again) I’m going to play with ingredients some. I used spicy Italian sausage fried up in small pieces and lowfat mozzarella cheese. You are so clever! My kids will love these. The change in cooking time was negligible, at best. I took them out right around 25 minutes and they were golden and lovely. Now that the times is figured, I am going to experiment with fillings and herbs. LOVE this recipe. I am lucky enough to have all the ingredients AND a mini muffin tin! I doubled the amount of flour and baking powder because they were so wet when I mxed them. They turned out great. I added sauted mushrooms and vegan pepperoni. I think I will be serving these at my daughter’s graduation party. Thanks for the never-ending inspiration. Now if I could only walk 4 miles a day! Hooray for a super easy after school snack. Mine will love it, thanks! These look absolutely wonderful! How clever! I can’t wait to try them! Love your blog and thanks for these little treats. I will be making them for lunch today. Whipped these up today, took 5 minutes to throw all the ingredients together. a million X better than anything out of the freezer. Can’t wait to try them again with some roasted peppers!!! Our variation on the recipe: doubled up the base ingredients (used standard cupcake pan), ground up in the processor mushrooms, bell pepper, zucchini, and onion. Added chopped jalapeno and pineapple chunky. Cook time (gas oven) 40 minutes. Consistency was light and fluffy, like a fritter, and the flavor incredible. So easy and delicious! Thanks for the inspirational recipe 🙂 Added to the weekly rotation. I live in McMinnville too!! Crazy..
Anyways, I stumbled upon this and decided to try it out for dinner tonight! Making a few vegetarian substitutions. I’m hoping it tastes as good as it looks and sounds. My son would LOVE these! He’d eat an entire tray by himself. Made these last night for girls’ movie night at my house. They were great! I also did a batch with broccoli instead of pepperoni. I added a dash of hot sauce and some garlic salt. They came out yummy, too. These look like a great appetizer for a party! Another great recipe! Thanks for the inspiration! I would love to see what they are like leftover from the fridge, but there aren’t any left! Also, I didn’t have any fresh basil, but I did sprinkle some Herbes de Provence on top before baking and they were fabulous! Wow! I made these tonight for my pepperoni pizza loving husband and son and they were sooooooo good!!! Definitely a keeper recipe! I made them in a regular size muffin pan and the bake time was as stated for the mini. Absolutely will be making these again!!! After seeing this recipe and the crabcakes recipe, I ran out to get a mini-muffin tin. These were easy to make, and the kids loved them. Thanks for sharing this! You have great recipes and yummy food. What a wonderful recipe!! I plan on changing the ingredients a bit to please my sensitive tummy – maybe adding veggies instead of roni. Thanks!! I stumbled upon this recipe (as I often stumble upon this site) today and decided to give it a whirl. I live in a house with three other guys and two batches of these didn’t last more than ten minutes total. They were a big hit and I’m planning to try making them with other fillings for some variety. Thanks so much for this, because I’ve been trying to promote more cook-at-home nights with the guys. Cheers! Wonderful and addicting. We made these the other night and they are so delicious. They will be on our go to list for pregame treats. My Boo would love those! Wha is it with kids and finger foods?! I just tried out the recipe, and they’re fantastic! Thanks for inspiration! Why would you need an excuse anyway ? WOW! I made these last night, and they were fabulous and sooo easy! I left out the pepperoni because I’m a vegetarian, and I replaced it with freshly minced garlic instead…delicious! Made these last night and they came out wonderful! Couldn’t believe how yummy these were! Before we knew it, they were all gone and I was in the kitchen making a second batch. Love how easy they are! Thanks for the recipes, this one just got added to my book! Can’t wait to try different meats/cheeses! Simply fantastic! I can’t wait to try these. Not only beautiful, but tasty! Your recipes always make my mouth water and now I am hungry…this looks so yummy. Perfect, and it is lunch time! I can see two ways that could have happened. First off, the recipe doesn’t specify what size egg to use. There can be a significant difference in egg sizes. But more than that, how the flour was measured could make an enormous difference. Someone who uses a scoop method would get far more than someone who spooned the flour into the measuring cup. Finally, if someone were to mistakenly use baking soda instead of baking powder, that sure would affect the sponginess of the final product. These look absolutely amazing. I may have to take these to one of our Memorial Day weekend cookouts! I love these!! I made them 2 days in a row and the boys in my house devoured them! such a hit. And so easy, I am completely useless in the kitchen, but these were foolproof! Thanks for posting! Hi Cathy, not sure if you will see this in time, but do these need to be enjoyed hot? I was thinking of making these and taking them to a get together we are going to this afternoon, but it takes us a good 30 minutes to get there. I could make the batter and just pop them in the oven there though. What do you think? They are definitely better served warm. I was thinking that same thing! A diet version! Has anyone made them this way? I was nervous that since skim milk is not as thick as whole it would disrupt the consistency. Any feedback? I am a chef at a group home for teenage girls. They are CONSTANTLY requesting that I make pizza or stromboli, and I get really sick of rolling out dough en masse. I was using StumbleUpon and came across this recipe the other day, printed it, and made a triple batch of these today. WOW! They’re amazing! I really think you’ve saved my life (and my tired arms!). I’m going to make a ton more and freeze them for the girls. Thank you, thank you, thank you. I used the 2% milk I had at home and couldn’t tell the difference at all. The first time i screwed up because all i had was a muffin pan, and not a mini muffin pan, so I made 12…but they came out GOOD. Next time we tried to double the batch, but we used cupcake paper holder cup thingys….big mistake. never the less this was an awesome recipe, im completely content with doubling the batch and using all 4 of my muffin trays, might be a pain to clean with all the crisco and all but I thinks its well worth it. Awesome recipe, I’ll have to try it soon! I so miss coming home from a long day and having snacks waiting for me! These look like a perfect after school (or work) snack! This should end the ongoing debate between my kids and me on whether or not frozen pizza rolls are actually food. They say yes, as they are sold in grocery stores. I say no as they contain no actual food ingredients. This recipe should put that debate behind us. Phew! I’ve tried this recipe twice now, they taste fantastic. Thanks a million. I have been trying to figure out what to make for my daughters 1st birthday party next week and then I came across this… Thank you so much for posting this! Can’t wait to try them. Did it work with rice flour? I am about to try this with 1 1/2 cups of gluten free bisquik. I made these a few weeks ago on a whim, had all of the ingredients lying around. Texture wise, they were great, however if I were to make it again I would not add pepperoni. I found it to give a greasy and overpowering taste. Small bits of prosciutto worked much better. For the ease of preparation, and the forgiving nature of pizza, you can’t go wrong. I just made these and they were amazing! Two thumbs up! A friend of mine made these for the kids at a playgroup and they were awesome. Now I will have to make some too! Thanks for sharing the recipe. These are so great! Very quick and easy to make. The batter is very light and fluffy. They are the perfect snack! I adore pizza, and these look seriously yummy and easy. Also great finger food when you’re curled up with a book on a rainy afternoon … lol. My plan is mild sausage, crumbled,and extra cheese, as I’m not a big pepperoni fan. Doubling the recipe sounds like a winner, too, as I don’t have a mini pan. Can these be made with Bisquick also? And for those folks who have football fans in the house — this seems like it would be a great addition to the munchies for the game. Your fan will love you forever! I’ve never tried Bisquick, they are good as the recipe is written. These were really easy to make! I thought it was a great idea for a little party snack as well! They tasted fine just a little plain. Seemed like the recipe is missing some salt and maybe it would be good with a few different types of cheese. Other than they are really a great little snack! Love your website, I’ve been browsing it for about a year, finally had an opportunity to cook for a potluck. I made a “Steak and Cheese” version. I quadrupled the recipe (big group, 4 batches) and used 1 LB of top round, some jalapenos, onions, and mushrooms, and substituted cheddar cheese for mozzarella. 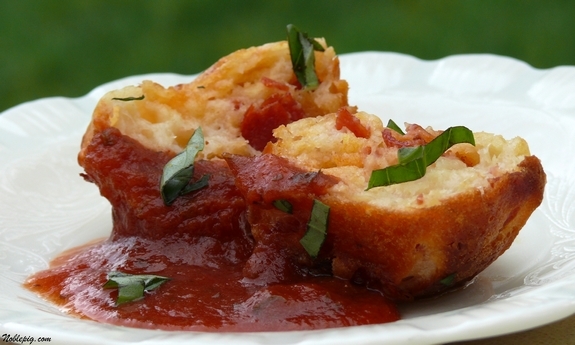 With the marinara dipping sauce, these were a huge hit! Thanks for the recipe, I’m sure I’ll continue to tweak and use it for years! Can these be made ahead and reheated?? I read this post last night and had to try it today! Didn’t have any pepperoni in the house, but we did have veggie bacon strips so we had cheesy bacony puffs for breakfast. Delicious! Thank you! Will use this recipe again and again. Hi There! I made these on this past Saturday. My niece and nephew LOVED them! They were really good and easy. Thanks for sharing! I made these tonight, but mine were done (almost burnt) at 14 mins, so I took them out. I haven’t seen any other posts regarding cooking times, so I have to assume it was just my oven or pan. I thought they were very good, and I can’t wait to take them to tailgates this fall! I went ahead and added in basil, oregano, and pizza seasoning as well as garlic powder to my mix before I baked them. I made a homemade pizza sauce to dip them in – YUM. This recipe is definitely a keeper. I can’t wait to try it Hawaiian style, as everyone has been saying! I’ve made the puffs several times and they have always turned out fantastic, so I wanted to see what might have gone wrong with your batch. One thing I tried that gave me a more dense, egg-like pizza puff like you reported was when I measured my wet ingredients with a dry measuring cup. Both have different volumes and while many times I haven’t noticed a big difference in baked goods textures, with these puffs I sure did. Not saying this is what happened with your batch, but this is such a small batch item and are designed to give a light, puffy product, the wet to dry ratio really is important, or at least it has been for me when I make them. I stumbled upon a picture of these on Pinterest and decided I needed to make them this weekend for an outdoor party with kids and adults. They were awesome. I made the following modificiations: batch 1-I added a packet of dry italian dressing mix instead of spices. Delightful! Batch 2-I subbed the pepperoni for crumbled up ground beef (drained for 30 minutes to get rid of excess grease) and real bacon peices and subbed italian cheese for cheddar. Both batches were gone within minutes. Great, easy appetizer! I think Stumbleupon has sent me to this post about 30 times and every time I say I’m going to make them…and so this time I’m going to do it! I love your recipes. thanks so much! These look really good! I think they’d be perfect to take to my next book club meeting. I’m always looking for finger food recipes. thanks! This is the best Pig i saw today. Yummy! These are SOOO yummy. I made them in a regular muffin pan, and they were perfect at 25 minutes. Delicious and so easy made these for father,s day and grandpa loved them! These would be so perfect for a dinner party appetizer! Now I know this is something my kids are going to love. As a single dad I really appreciate recipe blogs such as yours. it makes cooking for the kids that much easier. Thank you so much and look forward to coming back. I mad these tonight. Also made some sauce out of a can of crushed tomatoes and lots of garlic & herbs. I doubled the recipe because I had a feeling my husband and kids would like it, and good thing I did… the really loved it. Thanks for the recipe, it was very easy and quick to make. These look yummy! I will make some later! Wow- how cute are these! I went to a friend of a friend’s football tailgate and they had something similar to this recipe.. So delish and SO glad I found a great looking recipe for them! Just made your pepperoni puff bites for 49ers playoff game, my daughter said they taste like homemade bagel bites. They’re a hit! Well thank you, glad you are enjoying it. Are you aware that the printing of this recipe is problematic? The second and third pages do not show up at all on the “Print Preview”. Have you considered a “Print” button? I enjoy this recipe and have used it alot but want to print it out for those times I don’t have internet access. Did you use plain flour? Curious – have you ever made batches of these & then tossed them in the freezer for an after school snack when you didn’t have tons of time? I’m thinking they’d work perfectly but was wondering if you’d already done it – I could learn from your wisdom (thaw before heating up? if from frozen, how long in the microwave?). These look incredible & I think we’ll try them a couple of different ways. Maybe even do a veggie version? chicken/spinach? Oh my…now I’m hungry! Thanks for this one. I stumbled onto this almost three years ago now and have been making them on a regular basis since. They are always a hit- everyone of all ages loves them. My god daughter who is now seven have been helping me make them since she was 5 and she can now do the entire thing by herself. I’ve made vegetarian versions with mushrooms and peppers, I’ve add olives and chilli. Anything works with this. Thanks for giving me a lifelong recipe- I know I’ll still be whipping these up when I’m 70 for the future grand kids! Not really my thing, but you can easily do that at any of the sites that are out there for your own personal use. Just made these, Amazing, I am freezing them for the shower party in July.. the only problem I had is that I would increase the ratio to have fuller and puffer bites as using this recipe for 2 trays of mini muffin trays were not as puffy as I would have liked, I started out using a generous 1 tablespoon of batter at first but ran out near the end. I realized as I was making them this is a popover recipe! Looks tasty, i might give it a try ! Thanks for the recipe Caty! I would like to try these but as there are just 2 of us I wondered if they can be frozen and thawed out as a d when you want them. Hmmm, I have never frozen them, but I would go ahead and give it a try.